Well, if you are not fond of overcrowded pools or swimming deep within them to find fantasy and fish of questionable species (review of Pool here), then maybe traveling to the ocean, staying in a summer home, and breathing in the salt air is more to your liking. 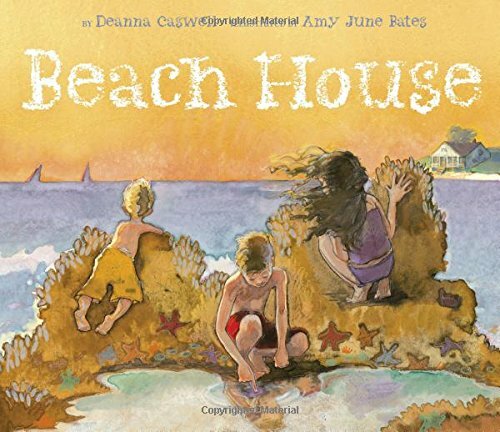 If so, then Beach House is the perfect picture book to kick off your summer. 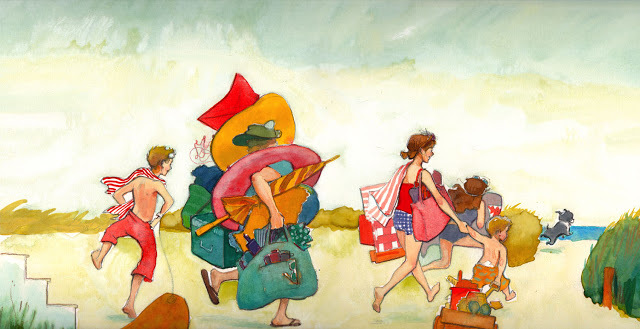 After a long drive—“Are we there yet?—the family arrives at the beach house for their summer vacation. The sea beckons, but the car needs unloaded, and the suitcases unpacked. So many bags, so much stuff. Amazing one family needs this much for a vacation from daily life. Fun waits as the clothes are hung and shoes arranged. The youngest son and his faithful pal look hopefully out the window at the beach and the water. Then the magic words that get everyone moving. Suits are on, and dad is loaded down with every imaginable beach toy and towels. The family hits the beach. The two kids gleefully run into the water with the puppy right behind them. The toddler plays in the sand, making castles and other sand-filled joys. After a full day of sun, sand, and water, the family cuddles up to a roaring fire for dinner and then the comfort of baths and soft beds. Tomorrow will be another day on the beach. The text, written in rhyme, easily flows off the tongue, fluently rhyming for readers and listeners alike. 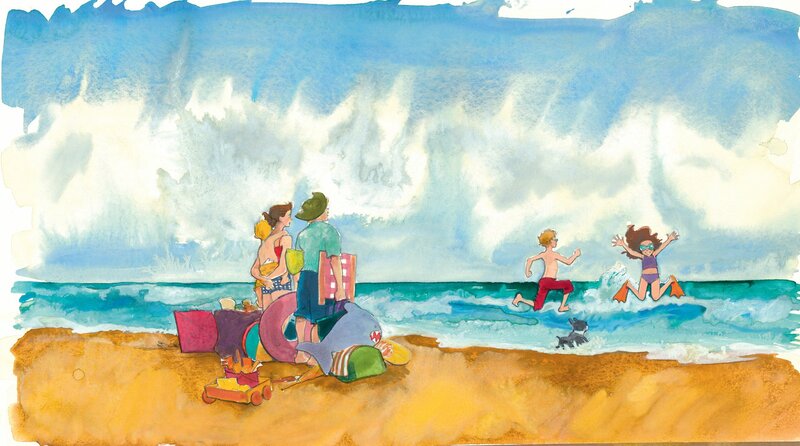 The watercolor and pencil illustrations exude summer on a soft, white, sandy beach that keeps the ocean where it belongs, allowing just a wave or two onto its shore. I am reminded of summer vacations with my family. Five of us crammed into a small cottage, swimming all day, eating ice cream bars on the stoop, and watching my older sister wash the paper plates—a joke I was too young to understand, or even remember without photographic evidence. Beach House brings out memories, or maybe, it will give you pause—a small suggestion—to plan that family getaway. BEACH HOUSE. Text copyright © 2015 by Deanna Caswell. Illustrations copyright © 2015 by Amy June Bates. Reproduced by permission of the publisher, Chronicle Books, San Francisco, CA. Purchase Beach House at Amazon —Book Depository—iTunes— Chronicle Books. Learn more about Beach House HERE. Awww, thank you for the kind review! What a perfect and fun summer read! I love going to the beach. I visited my favorite beach on the gulf coast a few weeks ago. Thank goodness my kids are grown and I don’t have to carry all of the extras. But, I remember those days.